Earlier this year I began watching Star Trek: Enterprise for the first time. I’m sorry I was one of the Trek fans to not give this show a chance while it was on the air. Now that I’ve made it through the second season Blu-ray set, I know I missed out on a good show. 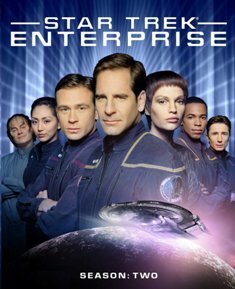 Star Trek Enterprise is still the black sheep of the Star Trek family, but I encourage any fans of the franchise to give it chance, because they might just discover that they like it after all. Season two deepens the relationships between the characters and features stronger storytelling than the more hit-and-miss first season. Given Enterprise is a prequel to the original series, it was able to explore the origins of the Trek mythos. Nods, both subtle and blatant, to other Trek series were woven throughout the episodes. In “Singularity” we see Lt. Malcolm Reed (Dominic Keating) developing “tactical alerts,” which we recognize will eventually become the familiar “red alert.” We also see that the Klingon Duras family had been causing trouble long before Next Generation’s Worf ran into them. It may feel, to some extent, that the show was messing around with established canon, but, save for a few exceptions, everything fits. One of those exceptions for me appeared in “Stigma,” where Vulcan mind-melding became an allegory for homosexuality. It seems that only a small percentage of Vulcans have the ability to mind-meld, and the behavior is seen as abhorrent by most Vulcans. Mind-melding also transmits the disease Pa’nar Syndrome, which was an all-too-obvious reference to HIV. Not only was this episode heavy-handed in its message, but I had a hard time accepting that mind-melding was once seen as a negative or that only a some Vulcans could do it. It had served as a poignant part of Star Trek II: The Wrath of Khan and the Next Generation episode “Sarek.” For a reference that worked better, see the episode “Regeneration,” which featured the Borg. This episode cleverly tied back to First Contact (the second Next Generation film). Character development flourished during the second season. “First Flight,” detailed how Archer (Scott Bakula) became Enterprise’s captain, and how he and Commander “Trip” Tucker (Connor Trinneer) established their friendship. Speaking of Trip, we get to see more sides to him. While he is usually portrayed as good natured, but with a quick temper, we get to see a more compassionate side to the character. In “Cogenitor,” one of the best episodes of the season, Trip finds himself compelled to help what he sees as an oppressed member of an alien society. With Archer and Trip uncharacteristically at odds with each other as they grappled over the no-win ethical situation, the emotions ran high. Though there were a few clunkers, such as the ridiculous “Precious Cargo” or the Enemy Mine-inspired “Dawn,” this season featured way more hits than misses. “Minefield” was a good spotlight for the underutilized Lt. Reed. While I usually find Reed kind of boring, I thought this episode made him much more well-rounded and interesting. “A Night in Sickbay,” gave us more of Dr. Phlox (John Billingsley) with Archer spending the night in sickbay while Phlox cares for an ailing Porthos (Archer’s dog). “Carbon Creek” injected some humor into the season with T’Pol (Jolene Blalock) enthralling Archer and Trip with the “true” account of when Vulcans first interacted with humans: 1957. Who knew Vulcans liked I Love Lucy, or that T’Pol looked exactly like her great-grandmother? One of the things I find most interesting about watching Enterprise on Blu-ray is the openness from the cast and crew about how maligned the show was by many Trek fans, and the lack of support the show had from the studio (UPN). Show creator, producer, and writer Brannon Braga is particularly forthcoming about his frustrations. His bitterness about its demise still shows. Other writers and cast members discuss their frustrations over not being able to establish story arcs, which they felt would have strengthened the series. The interviews also feature insights into the episodes and characters, as well as little anecdotes about the show’s production. The Blu-ray set is loaded with features, which are spread out over the six discs in the set. One of the highlights is the “In Conversation: The First Crew” 90-minute documentary. The roundtable discussion includes Brannon Braga with the series’ principal cast reflecting on the show. The piece is the first time the cast had gathered together since the series wrapped in 2005 and provides a unique look at the show. The three-part documentary “Uncharted Territory,” featuring the aforementioned interviews with cast and crew, is broken down into segments focusing on the transition between season one to two, the inter-relationships of the characters, and how the cast and crew dealt with a changing of the guard at UPN. Select episodes feature deleted scenes and commentary tracks, with two episodes featuring text commentary. There are several “Archival Mission Logs,” which are ported over from the previous DVD release and focuses different aspects of the show. A gag reel shows some funny mistakes and general fooling around on the set. Overall, this is a great supplemental package. I said it when I reviewed season one, and I’ll say it again now, Enterprise is a good show worthy of the Star Trek canon. This great Blu-ray set gives Trek fans the chance to reexamine the show that has taken a back seat to all the other series. Time to give Enterprise the chance it deserves.